If the machine ate enough brains of people who understood Chinese, would it understand Chinese? 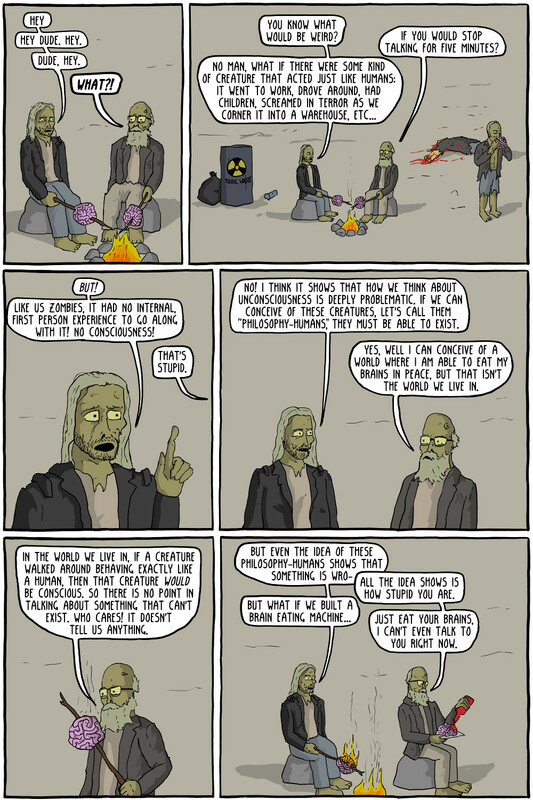 This comic is a parody of Philosophy Zombies, an imagined creature that behaves exactly like a human but has no consciousness. David Chalmers (the zombie on the left), believes that even the fact that we can conceive of these zombies means that physicalism (the idea that consciousness, along with everything else, is purely physical) is false. Dan Dennett (the other zombie) believes that the whole thought experiment is incoherent, and that any creature that had the same functionality as humans would simply be conscious.